The Dutch East India Company, also known as the VOC (Vereenigde Oostindische Compagnie), after being driven out by Chinese Ming forces near PengHu they arrived in Taiwan in 1623. Quick to recognize profitable sources they protected their trading interests and used the island as a base for trade with Japan and China. However they were later on expelled from Taiwan in 1662 which brought Taiwan back under control of Qing dynasty, now different tea varieties were imported from Fujian to be cultivated in northern Taiwan during the Qing dynasty (1796-1895). The VOC earliest mention of wild tea found growing in the central mountain region of Taiwan was in 1645 (two wild, indigenous tea subspecies, Taiwan Mountain Tea and Red Sprout Mountain Tea). China had severe restrictions on trade and Britain ignited the Opium War for tea in 1839 as a result China was forced to open five ports to foreign trade of which two were in Taiwan, Kaoshiung and DanShui. The Dutch built two forts; Zeelandia in Tainan and Antonio (part of the Fort San Domingo complex earlier built by the Spanish 1628). Fort Antonio is locally referred as “hongmao” Red Hair Fort 🙂 or Red Tower, due to the Opium War the British took over and made it their trade consulate. The former British consular residence is a popular tourist attraction since it is located at the DanShui (TamSui) river, during the weekends many locals are found to stroll around the waterfront, old street up to Fisherman’s Wharf relaxing and enjoying sea breeze to cool down. 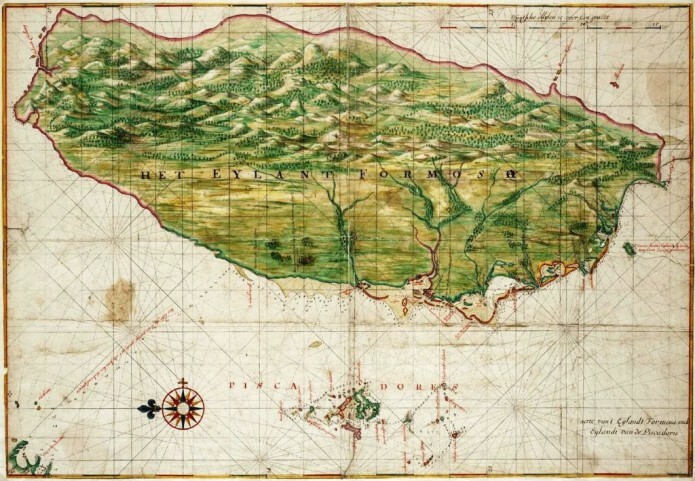 With the open port and trade consulate in DanShui, the Scottish merchant John Dodd arrived shortly during his visit to buy camphor he realized that the land in the region had superb qualities for tea exploitation. Most people have forgotten or not even realize that Taiwan during Qing dynasty was worlds major producer of Camphor. Camphor is used to make celluloid and one of the components to make film, as such you could say contributing to Hollywood’s success early hay days. John Dodd saw the potential of Taiwan Tea and provided loans to farmers to increase tea production. In 1867 he started tea company in WanHua, Taipei City together with Fujian-born Lee importing seedlings from Xiamen and bringing in skilled workers from FuZhou. Selling Taiwanese Oolong Tea as “Formosa Oolong Tea”, aware of British plans to develop a tea industry in India, Dodd’s successfully exported tea in 1869 to England and New York. Without a doubt Dobb and Lee were the front runners of successfully penetrating the global tea-market and sky-rocketing Taiwan’s tea industry together with the economic policy as a basis for the beginnings of Taiwan’s modern international trade legacy set up earlier by the Dutch VOC beginning with the port system facilitated at the time. We travelled on to our next destination, but our sojourn was absolutely amazing. The campaign was a beautiful and a well thought enterprise to market Taiwan it really embodied what we experienced. We can full heartedly confirm that visiting this ‘beautiful island’ is absolutely worth the discovery to plan as your next holiday destination.